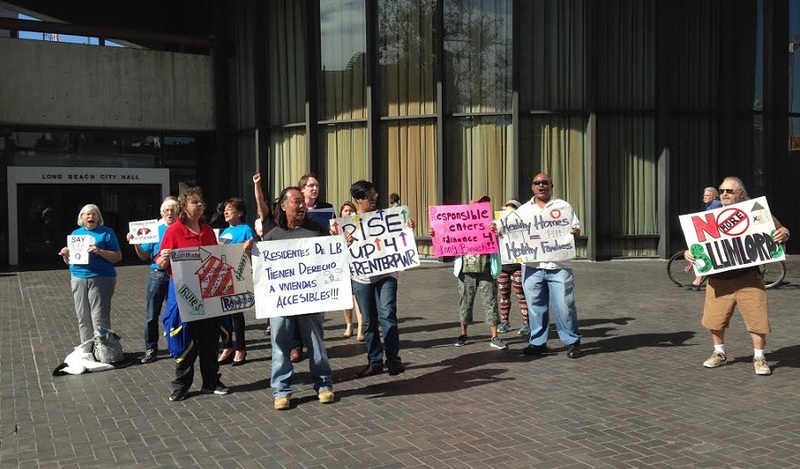 Community members demonstrate in front of City Hall last November in support of rent control. File photo by Stephanie Rivera. As a local tenants’ rights organization works on getting rent control on the ballot in Long Beach, two housing groups have expressed their opposition to the issue, and in the process revealed that the entire city council along with the mayor share their stance. In a city that is composed of about 60 percent renters and represented by multiple moderate and left-leaning Democratic politicians with a history of favoring labor groups, this news may be surprising, but in fact, all of the council members have at one point in time joined the mayor in opposing rent control. When asked about those statements, a PWR official provided the Post with responses by seven council members who filled out PWR questionnaires when they were seeking their support as city council candidates in 2015-16. When asked if government should regulate rental rates, Councilmembers Daryl Supernaw, Jeannine Pearce, Dee Andrews, Al Austin, Suzie Price, Stacy Mungo, Vice Mayor Rex Richardson and Mayor Robert Garcia all said no. Some council members elaborated on their responses, with Austin stating the need for adequate housing stock at different income levels and Richardson suggesting that the government should only regulate rental rates when it owns or subsidizes property. The Post reached out to all council members to confirm their current stances on rent control. Supernaw confirmed he is still opposed. Seventh District Councilman Roberto Uranga, who didn’t provide a written statement to PWR, said he sees rent control as a last resort for a city that has not taken care of its housing needs. “Rent control initiatives prove we have an issue with housing and affordability, and I would prefer that we fix it through negotiation like some sort of just cause eviction,” Uranga told the Post in an email. As efforts are underway to put rent control on the ballot, Pearce said it will be up to the voters to decide but noted that other options should be explored. “Rent control is not a black and white issue, and we need to make sure that we are looking at every possible tool in the toolbox as we move forward to address our housing crisis,” Pearce said in an email to the Post. The rest of the council members were either not available to comment at the time of publication or did not respond to requests for comment. Yesterday Apartment Association, California Southern Cities (AACSC) released its own statement opposing rent control, similar to that of PWR. Both PWR and AACSC called the potential measure that “an organization that is largely funded with money from outside the city is attempting to place” on the ballot is harmful to local property owners and tenants, stating rent controlled cities are typically the most expensive in the country. Butler said the city officials’ positions on rent control has been known a long time which is why HLB is working to get the issue to the voters directly. Currently, the city attorney’s office is working on the ballot title and summary for the rent control measure. Once that is complete it will then be submitted to the city clerk’s office.